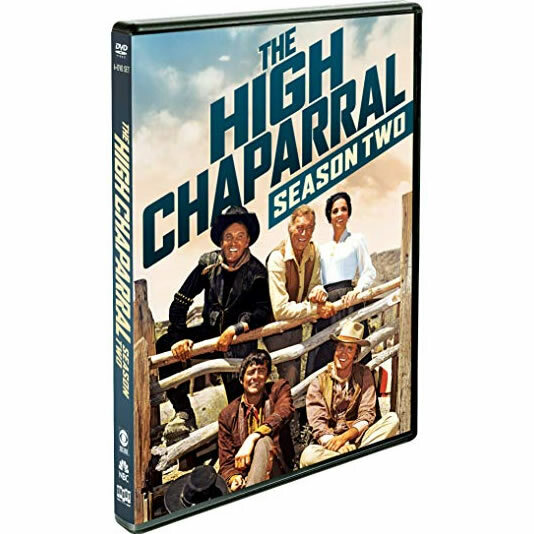 Leif Erickson, Cameron Mitchell, Mark Slade, Henry Darrow, and Linda Cristal star in The High Chaparral, the Primetime Emmy-nominated drama from David Dortort, the producer of Bonanza. Deep in the Arizona Territory lies the High Chaparral Ranch, run by “Big John” Cannon (Erickson) along with his brother Buck (Mitchell) and son Billy Blue (Slade). After a tragic attack leaves him a widower, “Big John” enters into a marriage with Victoria (Cristal), the daughter of a powerful neighboring rancher. Along with Victoria’s brother Manolito (Darrow), the Cannons must manage the ranch, their new family dynamic, and the perils of the West. The High Chaparral: Season Two guest stars include Ricardo Montalban, Jack Elam, Robert Loggia, Yaphet Kotto and Denny Miller. Enjoy every thrilling episode from the hit series’ 1968-69 season! Blue and the son of the local Apache Chief are both after a wild black stallion. The fight over it may spill over into a war with the tribe but the Chief allows Blue to keep the horse. When his son steals the horse, the problem resurfaces. Pima Indians are attacking and killing Apaches in the area. Blue and Buck find two orphaned Apache boys that trail them back to the High Chaparral and morph into ten Apache kids. One is the grandson of Geronimo putting the ranch in danger. Sam receives a letter causing him to return home to kill a man who is also a good friend. The men learn from San and his brother Joe that Sam has a wife and daughter. Worried the men decide to follow to support Sam’s quest for revenge. Buck is conned into spending his poker winnings on a saloon closed by the women of Oracle led by the teetotaler school teacher. Buck has to restore the damaged saloon plus fend off the school teacher angry with Buck’s new employee. Buck leads a pack train taking supplies to the ranch. He needs shells but two men bought out the store. The men bought the supplies for the gang of an escaped convict Manolito helped jail. The men convince the gang to steal the pack train. Big John brings in a newspaperman to publish a paper in Tucson. He hopes it will pressure the governor to clean up the criminal element. However, Pogue who leads and protects the criminals wants Ebenezer dead as he has a past with him.